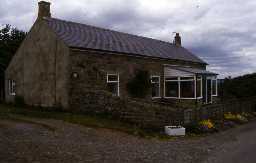 Newbiggin Hall Cottage, Hexhamshire Low Quarter. Photo by Peter Ryder. This cottage was originally a bastle. It would have measured about 9.5m long by 6.9m wide but has been extended and altered. The walls are built of large stones and are just over one metre thick. On the south side the base of the wall has a boulder plinth and there is also a narrow opening or slit through the wall. Traces of an upper doorway can also be seen in this wall.